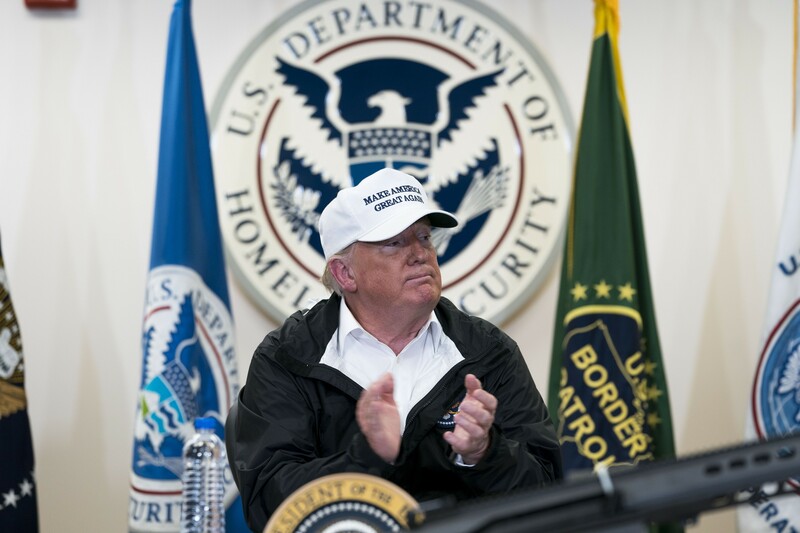 President Donald Trump receives a briefing about border security at the Rio Grande in McAllen, Texas, Jan. 10, 2019. Trump will ask Congress on March 11 for $8.6 billion in additional funding to build a wall along the United States border with Mexico. WASHINGTON — President Donald Trump sent Congress on Monday a record $4.75 trillion budget request that calls for increased military spending and sharp cuts to domestic programs like education and environmental protection for the 2020 fiscal year. Trump’s budget, the largest in federal history, includes a nearly 5 percent increase in military spending — which is more than the Pentagon had asked for — and an additional $8.6 billion for construction of a border wall with Mexico. And it contains what White House officials called a total of $1.9 trillion in cost savings from mandatory safety net programs, like Medicaid and Medicare. The budget is unlikely to have much impact on actual spending levels, which are controlled by Congress. Democratic leaders in both the House and Senate pronounced the budget dead on arrival on Sunday. But the blueprint is a declaration of Trump’s re-election campaign priorities and the starting skirmish in the race for 2020. The president’s fiscal plan quickly antagonized Democrats while making clear the contours of how he plans to run for re-election. It is replete with aggressively optimistic economic assumptions and appeals to his core constituents, and it envisions deep cuts to programs that Democrats hold dear. The budget includes proposals that would reduce Medicare spending on prescription drugs and payments to some hospitals through a number of policy changes. The changes to the drug program may have the effect of increasing premiums for Americans who rely on Medicare, but they would also, for the first time, limit the amount that seniors with very expensive drugs could be asked to pay each year. The Medicare changes would save $846 billion over a decade, in part through curbing “waste, fraud and abuse.” The administration also proposes spending $26 billion less on Social Security programs, including a $10 billion cut to the Social Security Disability Insurance program. The budget would not balance for 15 years.